The fifth edition of this flagship report analyses the state of the world’s ultra high net worth (UHNW) population, or those with $30m or more in net worth, and this year revealed global growth of 3.5% to 226,450 individuals and a 1.5% increase of their total combined wealth to $27 trillion. While this growth in population and wealth reflects a recovery from a steep decline in 2015, the report also reveals that average individual wealth in this population declined for the first time since 2013, demonstrating that in 2016 UHNW population growth outpaced wealth generation for the ultra-affluent. There were sharp regional fluctuations in dollar-denominated wealth creation, with North America and Asia recording the only significant rises in wealth. The New York metropolitan area’s UHNW population grew 9% to 8,350 individuals. Total liquid assets (primarily cash) owned by global ultra high net worth individuals stood at $9.6trn in 2016, accounting for the largest share (35.4%) of their holdings. Despite heightened geopolitical instability, the global ultra wealthy population is forecast to rise to 299,000 people by 2021, representing an increase of 72,550. 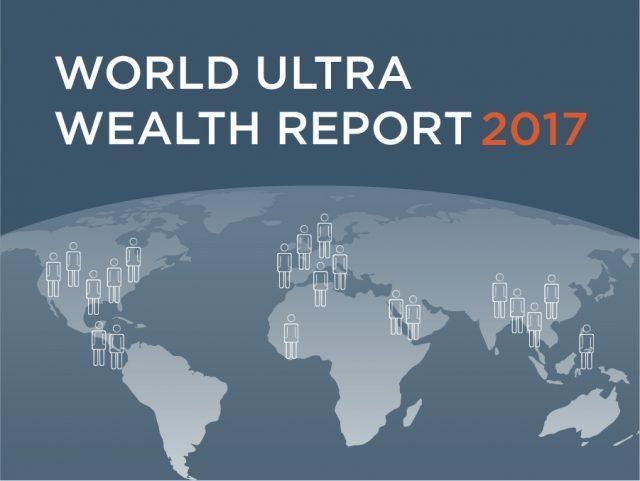 In addition to revealing a global view of the status and trends of the ultra wealthy, the World Ultra Wealth Report 2017 also examines this population based on their asset holdings, gender, industry focus, wealth source, education and hobbies. From this insight, the report reveals information on the “typical” UHNW individual and compares this profile to other ultra wealthy archetypes including UHNW Millennials, those who are Ivy League educated, the female UHNW population, and those in emerging Asian markets. Wealth-X is a wealth information and insight business with unique data assets and specialized skills, offering the world’s largest collection of hand curated dossiers on the ultra wealthy and the world’s leading high net worth market research. Founded in 2010, with more than 200 staff across North America, Europe and Asia, Wealth-X works with over 500 clients across the financial services, luxury, not-for-profit and higher education industries to fuel strategic decision-making in sales, marketing and compliance.